The pupil premium funding is designed to help disadvantaged pupils of all abilities perform better, and close the gap between them and their peers. It's up to schools how this money is spent, but they do have to account for the impact on pupils and value for money that's resulted from their decisions. Use this four-step plan and resources to ensure success. As a school leader, it’s your responsibility to use your pupil premium funding wisely and for the purpose it’s intended: to raise the attainment of disadvantaged learners. Pupil premium expert Richard Sutton has distilled his experience of over a hundred pupil premium reviews into his pupil premium accountability, leadership and provision guide. He explains how your one-year operational plan is your key document for holding leaders to account. With the right targets and structures in place, subject teams can focus on classroom provision and appropriate intervention. Reams of paperwork are not needed. The pupil premium website template is the ideal basis for your one-year plan. It's easy to fall into a trap of focusing on the funding and continuing with the same interventions that have been used year-on-year, without considering impact or value for money. Disadvantaged champion Vanessa Burton shares her story of how a reduction in staffing prompted her to rethink their school strategy and begin afresh. With the pupil premium funding having been in schools since 2011, there’s now a body of research to learn from when it comes to what works for raising the achievement of disadvantaged pupils. One consistent theme comes through: there are no quick wins or one size fits all solutions. Provision needs to be personalised to meet the specific needs of pupils in your school. What are their barriers to achievement? What can you do to overcome them? ‘We have to be creative about how we spend our funding – we can’t afford to employ additional TAs, for example, so we look for low-cost, high-impact provisions that make a difference to individual children,’ says Rachael Foster, deputy headteacher at Blean Primary School in Canterbury. Are you confident in knowing where the attainment gaps lie in your school? Do you know how your progress data compares against national averages? Download and adapt the pupil premium audit template to analyse outcomes and identify where you need to focus your resources. And remember: pupils spend most of their time in the classroom. High quality classroom teaching is probably the most effective intervention you can provide for your disadvantaged learners. Don't make this a one-off exercise. 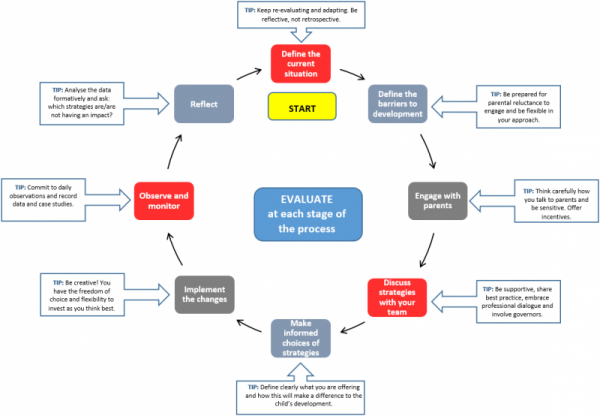 Evaluate your approach at every stage of the process, as illustrated in the early years pupil premium decision chart. Planning provision for your disadvantaged learners should be a cyclical, not linear, process. For details of funding payments, see pupil premium funding and accountability for schools on the DfE website. Want to ensure your school is allocating its Pupil Premium money effectively? Our two-day Pupil Premium review will give you a comprehensive report, based on a review of your school's data and a visit from one of our expert consultants.